In this article, the 2010 European League against Rheumatism (EULAR) recommendations for the management of rheumatoid arthritis (RA) with synthetic and biological disease-modifying antirheumatic drugs (sDMARDs and bDMARDs, respectively) have been updated. The 2013 update has been developed by an international task force, which based its decisions mostly on evidence from three systematic literature reviews (one each on sDMARDs, including glucocorticoids, bDMARDs and safety aspects of DMARD therapy); treatment strategies were also covered by the searches. The evidence presented was discussed and summarised by the experts in the course of a consensus finding and voting process. Levels of evidence and grades of recommendations were derived and levels of agreement (strengths of recommendations) were determined. Fourteen recommendations were developed (instead of 15 in 2010). Some of the 2010 recommendations were deleted, and others were amended or split. The recommendations cover general aspects, such as attainment of remission or low disease activity using a treat-to-target approach, and the need for shared decision-making between rheumatologists and patients. The more specific items relate to starting DMARD therapy using a conventional sDMARD (csDMARD) strategy in combination with glucocorticoids, followed by the addition of a bDMARD or another csDMARD strategy (after stratification by presence or absence of adverse risk factors) if the treatment target is not reached within 6 months (or improvement not seen at 3 months). Tumour necrosis factor inhibitors (adalimumab, certolizumab pegol, etanercept, golimumab, infliximab, biosimilars), abatacept, tocilizumab and, under certain circumstances, rituximab are essentially considered to have similar efficacy and safety. If the first bDMARD strategy fails, any other bDMARD may be used. The recommendations also address tofacitinib as a targeted sDMARD (tsDMARD), which is recommended, where licensed, after use of at least one bDMARD. Biosimilars are also addressed. These recommendations are intended to inform rheumatologists, patients, national rheumatology societies and other stakeholders about EULAR's most recent consensus on the management of RA with sDMARDs, glucocorticoids and bDMARDs. They are based on evidence and expert opinion and intended to improve outcome in patients with RA. With abundant therapeutic options available and insufficient information on differential efficacy and safety, making treatment decisions in clinical practice remains challenging. To this end, the European League Against Rheumatism (EULAR) has recently developed recommendations for the management of RA with these drugs.3 These recommendations were based on five systematic literature reviews (SLRs)4–8 and focused on indications for the use of, and suggestions for, differential and strategic employment of csDMARDs and bDMARDs based on treatment targets, disease risk assessment, safety aspects and contraindications. While some of the individual recommendations have elicited extensive discussions, all of them were based on the evidence available at that point in time4–8 and on the results of the discussions and votes by the expert committee. Moreover, the EULAR recommendations have been used and adopted widely, as suggested by their application as a template for many national and regional recommendations after their publication.9–12 However, as with most recommendations and especially in a rapidly evolving field such as RA, it was anticipated that the 2010 recommendations would need updating within a few years.3 Indeed, more experience and additional evidence on agents approved at that time, as well as data on new compounds, have become available over the last 3–4 years, motivating us to update the recommendations as described here. With the approval of the EULAR Executive Committee, the convenor (JSS) and epidemiologist (RL) who led the 2010 activity formed a Steering Group and a Task Force with the aim of updating the 2010 EULAR recommendations for the management of RA. Comprised of 33 members from 11 European countries and the USA, this EULAR Task Force included four patient representatives, 24 rheumatologists, an infectious disease specialist, a health economist and three fellows; care was taken to have a good representation of clinicians and experts experienced in RA clinical trials and their analysis from all European regions. Initially, a Steering Group prioritised research questions and search terms for the three SLRs. These searches expanded and updated the available published information on efficacy of csDMARDs (as monotherapy or combination therapy, with and without glucocorticoids), efficacy of bDMARDs (as monotherapy or combined with csDMARDs) and safety aspects of csDMARDs and bDMARDs; treatment strategies were contained in the present SLRs rather than being separate as in 2010.7 Although the SLRs informing the 2010 EULAR recommendations also included a search on economic evaluations,8 the Steering Group felt that re-evaluation was not necessary because the approval status and price of new agents such as bsDMARDs was unknown. At a subsequent meeting, these data were presented first to the Steering Group consisting of nine rheumatologists, an infectious disease specialist and a patient representative, who drafted a preliminary set of new recommendations based on their discussions. The search results as well as the drafted proposal for the recommendations were subsequently presented to the whole Task Force and discussed in detail in four break-out groups focusing on (i) csDMARDs and tsDMARDs, (ii) glucocorticoids, (iii) bDMARDs and (iv) safety aspects. After these deliberations, each subgroup reported their respective results and made new proposals for the recommendations to the entire group. After discussion, the Task Force then amended them as deemed appropriate to achieve final consensus, ultimately voting on each individual recommendation. When an initial majority of 70% in favour of—or against—a recommendation or formulation was not achieved, the contents or wordings were amended until a majority of the Task Force members approved the individual item. The results of the final ballot are presented for each of the recommendations as a percentage of voting members. An ultimate round of wording refinements was carried out via electronic communication but with no changes of the meaning permitted. This was accompanied by anonymous voting on the strength of recommendation (level of agreement) for each item on a 0–10 scale (0, no agreement at all; 10, full agreement). A few principal considerations had already been developed by the Steering Group before the SLRs and were subsequently approved by the whole Task Force: (i) all of the 2010 recommendations should be reconsidered on the basis of new available supportive or contradicting evidence and voted upon; (ii) any of the previous recommendations could be kept as had been formulated, could undergo textual amendments, could be totally abandoned or could be shifted from a prominent place in the table listing the individual recommendations to the text accompanying them; (iii) although not yet approved and used in clinical practice outside the USA at the start of the current activity, it was deemed important to at least discuss and possibly formulate a recommendation on the application of tofacitinib based on the evidence from the literature; (iv) while not yet approved or used in practice in Europe or North America, it was also deemed important to at least discuss and potentially express a view on the place of biosimilars in the therapeutic arena based on available evidence. In line with these a priori considerations and the potential need to provide some totally new recommendations, each of the three overarching principles and 15 recommendations of the consensus published in 2010 underwent thorough re-evaluation for their validity based on information that had become available from trials and registries during the years since the last SLR and consensus finding; where no new evidence had been found, the evidence from the 2010 searches was applied. As with the 2010 recommendations, this 2013 update reflects the balance of efficacy and safety, but does not deal with the toxicity of DMARDs in detail; this can be derived from the results of the safety SLR; all three SLRs provide an important adjunct to these recommendations, since they establish the evidence base. Thus, in line with the 2010 recommendation, the 2013 update primarily considers agents with toxicity that appears to be manageable, assuming that prescribers are either aware of the respective risks or will adhere to the information provided in the package inserts. However, where toxicity appears to be a major issue, a general warning is included in the respective recommendation. In line with the 2010 recommendations, the Task Force felt again that some of the principles of treating RA are of such a generic nature that they should be separated from individual recommendations on individual therapeutic approaches or compounds. However, the sequence of these principles was changed and the wording refined (table 1). Treatment of RA patients should aim at the best care and must be based on a shared decision between the patient and the rheumatologist. This principle was originally ranked as B,3 but the Task Force decided that decision-sharing by patient and rheumatologist is of such overwhelming importance that it should spearhead the recommendations. Shared decision-making includes the need to inform the patient of the risks of RA and the benefits of reaching the targeted disease activity states as well as the pros and cons of respective therapies. It also means two-way communication and joint or shared decision-making on the therapeutic target and management plan as well as support for the patient to develop personal preferences. The term ‘best care’ inherently refers to the recommendations provided here. Rheumatologists are the specialists who should primarily care for RA patients. Shifting this item from rank A to B was not at all meant to diminish the role of the rheumatologist in the care of patients with RA. Indeed, the wording of this principle remained unchanged and the rheumatologist is already mentioned in item A and should constitute the main counselling anchor for patients with RA. Further, the evidence for provision of better care by rheumatologists in comparison with other physicians (see item A: ‘best care’) has been briefly reviewed in the 2010 recommendations and further corroborated since then.17 ,18 The term ‘primarily’ constitutes a short cut with several thoughts behind it that go even beyond the considerations expressed in 2010: first, it reflects the necessity to involve other physicians experienced in the care of RA patients, including experience in novel therapies and their potential complications, where there is a lack of trained rheumatologists; second, it is consistent with multiprofessional care and thus with current trends in some countries for an increasing role of non-physician health professionals who are well trained in the care of patients with RA, such as rheumatology nurses,19 as long as the responsibility in general is in the hands of the rheumatologist; and third, the term ‘primarily’ should also remind the rheumatologist that multidisciplinary care may sometimes be needed, especially when dealing with comorbidities, such as cardiovascular disease,20 or complications of applied therapies, such as serious infections. RA incurs high individual, societal and medical costs, all of which should be considered in its management by the treating rheumatologist. Slightly reworded, the meaning of this principle has not changed from last time. It consists of two parts. The first part relates to the costs incurred by RA for the individual patient/family and society and mentions the costs of modern therapies. It has been well established that RA incurs a substantial socioeconomic burden,21 and this has recently been supported by the Global Burden of Disease studies.22 ,23 In this context, the cost-effectiveness of treating RA has been repeatedly addressed, and the impact of modern therapies on late, costly consequences of RA, such as joint replacement surgery, is noteworthy.24 ,25 While rheumatologists cannot generally be held responsible for costs of treatment when attempting to provide best care in line with overarching principle A, this item does reiterate the responsibility of the rheumatologist to consider economic implications when selecting between treatment strategies or modalities with similar efficacy and safety in the short or intermediate term. Comparative meta-analyses and head-to-head studies help us to judge similarities or differences between therapies,26–30 although—as will be discussed below—the qualities of the studies may differ, which should be thoroughly weighed in therapeutic decision-making. Cost considerations by rheumatologists will become more important once biosimilar biological agents become available.31 In parallel, payers (governments or social security agencies) ought to take the overall individual and societal implications of RA into account when making decisions on medical costs. The discussion process of the Task Force led to 14 (rather than the previous 15) recommendations. This reduction is due to the elimination of three of the 2010 items (Nos 10, 11 and 14) and the addition of two new recommendations. The decision to delete old item 10 (mentioning the potential use of ‘azathioprine, cyclosporine A [or…cyclophosphamide]’) was taken unanimously; the decision to remove old item 11 (‘Intensive medication strategies should be considered in every patient, although patients with poor prognostic factors have more to gain’) was likewise taken unanimously because those treatment strategies are now well established, and several of the revised recommendations inherently incorporate a strategic approach to treating RA intensively. Finally, a 94% majority vote supported deleting previous recommendation 14 (‘DMARD-naïve patients with poor prognostic markers might be considered for combination therapy of MTX plus a biological’); for more details see explanations on new No 9. However, it was simultaneously decided to mention these therapeutic considerations in the text accompanying pertinent recommendations. The 14 recommendations arising from the current activity are presented in table 1 and discussed in detail below. With the exception of the first two items, which are the mainstay of the therapeutic approach to RA, they are not primarily weighted by an order of importance, but rather follow a logical sequence and procedural hierarchy. They are summarised in abbreviated form in the algorithm presented in figure 1. Table 2 displays the levels of evidence and grades of recommendation based on the Oxford Levels of Evidence assessment, as well as the primary voting results at the Task Force meeting and level of agreement/strength of recommendation voting by the Task Force. Therapy with DMARDs should be started as soon as the diagnosis of RA is made. This recommendation is almost the same as in 2010; the term ‘synthetic’ before DMARDs was omitted to emphasise the generic nature of this recommendation, focusing particularly on the importance of diagnosing RA early and treating it appropriately as soon as such a diagnosis is presumed. To this end, the 2010 American College of Rheumatology (ACR)–EULAR classification criteria (which had only been in development when the 2010 EULAR RA management recommendations were discussed and are now well established)32 should be used to support diagnosis and facilitate early introduction of effective therapy in RA. Although diagnosis relies on the individual rheumatologist's judgement about the disease in a particular patient at a particular point in time, whereas classification relates to the group level and is important primarily for clinical studies, the new classification establishes general criteria for early diagnosis. In the course of its discussions, the Task Force reiterated both the importance of the presence of clinical synovitis in at least one joint (in line with the 2010 classification criteria) and the essential importance of starting DMARD therapy as soon as possible. Treatment should be aimed at reaching a target of remission or low disease activity in every patient. The definition of the treatment target was deemed of such fundamental importance that the Task Force decided that aspects of patient follow-up should not dilute it. Therefore the former recommendation 2 is now split into two recommendations, items 2 and 3. When the 2010 EULAR recommendations were set forth to target remission,3 ,33 the ACR–EULAR remission definition was still in development; in the meantime, more stringent criteria have been published34 by ACR and EULAR and should be applied in the context of these recommendations for the actual definition of remission as the optimal treatment target. Remission as defined by the Disease Activity Score based on 28 joint counts (DAS28<2.6) is not regarded as sufficiently stringent to define remission.34 The proportion of patients reaching remission by the ACR–EULAR criteria in clinical trials and practice is sufficiently large to warrant their preferential and widespread use in daily care of RA patients.35–38 A large array of data has confirmed the value of reaching stringent remission not only with regard to signs and symptoms of RA, but also with regard to achieving maximal functional improvement and halting progression of structural damage39–44; thus good outcomes in terms of physical function and structural changes are implicitly included in targeting good clinical outcome. Moreover, the Task Force agreed with the 2010 recommendations and similar recommendations by another expert committee,27 namely that low disease activity defined by composite measures45 is a good alternative goal for many patients who cannot attain remission even today, especially those with long-standing disease who actually constitute the majority of patients in clinical care. Indeed, although somewhat worse than remission, low disease activity conveys much better functional and structural outcomes than moderate or high disease activity.38 ,40 ,46 Because a significant proportion of patients in clinical practice still do not attain a state of remission,37 ,47 ,48 implementation of this combined therapeutic target appears to be particularly relevant and significant. Also, once any patient has reached a low disease activity that is close to remission, the individual disease activity variables have to be considered in detail before major therapeutic changes are made. Monitoring should be frequent in active disease (every 1–3 months); if there is no improvement by at most 3 months after treatment start or the target has not been reached by 6 months, therapy should be adjusted. In contrast with the second half of prior recommendation 2, which also dealt with follow-up and treatment adjustments that could be interpreted or used differently than intended, statement 3 of the updated recommendations is very specific and clarifies any potential incongruity. First, monitoring should be performed as frequently as disease activity necessitates, namely more frequently (such as every 1–3 months) with active disease and less frequently (such as every 6–12 months) once the treatment target has been stabilised. EULAR also advocates the use of composite measures of disease activity, which include formal joint counts and the application of the ACR–EULAR criteria for remission.34 ,45 Further, this item clearly specifies that the treatment target (remission or at least low disease activity, see item 2) should be attained within 6 months and not necessarily within 3 months; the 3-month time point relates solely to assessing improvement, meaning reduction of disease activity from a high to at least a moderate state by composite measures.45 If there is no improvement in disease activity (such as persistence of high disease activity as assessed by composite scores) after 3 months and provided that therapy has already been adjusted to maximise treatment effect, the ongoing therapeutic regimen is usually unlikely to lead to the treatment goal in many additional patients even by 1 year and should be modified.49 Maximisation of treatment effects includes reaching an optimal MTX dose within a few weeks and maintaining the maximal dose (25–30 mg weekly) for at least 8 weeks.50 If improvement is achieved at 3 months,51 ,52 it must be borne in mind that maximal efficacy will not be seen before 6 months in many patients with most treatment strategies. This is true for all types of therapies, including most biological agents. A similar approach should be made if the treatment target (remission or low disease activity) is not attained at 6 months. Of note, individual patients may be well on their way to reaching the targets of low disease activity or remission at 6 months and might just take slightly more time to attain this desired state. Therefore the change in disease activity from treatment start to the 6-month time point will have to be taken into account when making final treatment decisions in the individual patient. MTX should be part of the first treatment strategy in patients with active RA. This statement (previously No 3) remains unchanged. The Task Force felt reassured by the respective SLR13 that MTX is a highly effective agent both as monotherapy and in combination with glucocorticoids, other csDMARDs and bDMARDs, and thus continues to serve as an anchor drug in RA.53 As monotherapy with or without glucocorticoids, it is effective in DMARD-naïve patients and leads to low disease activity states or 70% improvement rates according to the criteria of the ACR (which correspond to nearly a state of low disease activity)54 in about 25–50% of patients with early RA within 6–12 months.35 ,55–60 Generally, this statement combines three aspects: first, by using the term ‘part of the first treatment strategy’, it implies that MTX, although effective as monotherapy, may be combined with other agents, such as glucocorticoids but also other csDMARDs (see above and below); second, by stating ‘active disease’ (suggested definitions: Clinical Disease Activity Index (CDAI)>10, DAS28>3.2 or Simplified Disease Activity Index (SDAI)>11),45 it implies that some patients with low disease activity (defined as CDAI≤10, DAS28<3.2, SDAI≤11) may not need MTX and can do well on alternative csDMARD therapies; the third aspect relates to patients previously treated with other csDMARDs who should receive MTX at a sufficient dose and for sufficient time before progressing to potentially more intensive therapies. Important aspects include dose optimisation,50 optimal use of folic acid,61 and recognition that the maximum effect of MTX is attained only after 4–6 months55–59; in this respect, the optimal dose (25–30 mg a week with folate substitution, or somewhat less in the case of dose-limiting side effects62), should be maintained for at least 8 weeks as an important aspect on the way to ultimate treatment success.50 For patients with contraindications to MTX, other drugs should be used (see next recommendation). Low-dose glucocorticoids should be considered as part of the initial treatment strategy (in combination with one or more csDMARDs) for up to 6 months, but should be tapered as rapidly as clinically feasible. As before, the Task Force heavily debated the role of glucocorticoids (previously recommendation 6). Indeed, this item was reworded (previously: ‘Glucocorticoids added at low to moderately high doses to sDMARD monotherapy [or combinations of sDMARDs] provide benefit as initial short term treatment, but should be tapered as rapidly as clinically feasible.’). Rather than just making the general statement that glucocorticoids may ‘provide benefit’, the Task Force now recommends that they should be considered as part of the initial therapeutic approach. This change is based on the respective SLR13 which includes additional information accrued over the last few years.85 ,92 Low dose refers primarily to a dose of 7.5 mg prednisone or equivalent per day or less.93 Mentioning glucocorticoids in a separate recommendation results from their proven capacity to increase clinical, functional and structural efficacy when combined with csDMARDs,92 ,94–96 and this combination has similar efficacy when compared with TNF inhibitors plus MTX60 ,97; thus glucocorticoids, both in initially high and rapidly tapered regimens (eg, COBRA) and at lower doses extended over a year or two, may increase DMARD activity and are even effective in this regard as monotherapy.98 ,99 However, glucocorticoid monotherapy is not specifically recommended by the Task Force and should only be used in exceptional cases when all other DMARDs have contraindications. A separate EULAR committee has concluded that the literature on safety of long-term glucocorticoid therapy at low doses still has important gaps, but in general does not support the notion of unacceptable safety issues100; subsequently, that committee formulated management guidelines that also address preventive measures against glucocorticoid-induced adverse events.101 The current SLRs13 ,15 are not in disagreement with any of the above findings. Nevertheless, the adverse event profile and comorbidity implications of glucocorticoids (and thus their benefit/risk profile) elicited a fierce debate within the Task Force. A compromise (based on expert opinion) to be more specific with respect to the time frame of their application by stating ‘up to 6 months’ rather than just ‘short term’ ultimately led to a majority vote; however, only 73% of the members approved this item (the lowest majority level of all recommendations), reflecting divergent opinions, with both proponents of a stronger and a weaker recommendation voting against. However, the level of agreement (strength of recommendation) was quite high (mean of 8.9) upon final anonymous grading. Thus, the Task Force suggests using them only as bridging therapy and limiting their use to a maximum of 6 months, ideally tapering them at earlier time points. However, neither chronic use of glucocorticoids in established RA nor intra-articular glucocorticoid applications were discussed. Of note, it was also decided to change the algorithm in figure 1 from the 2010 version by downsizing the ‘−’ compared with the ‘+’ in the ‘±’ symbol to reflect the increasing agreement of the Task Force that glucocorticoids should be combined with MTX or other csDMARD regimens. If the treatment target is not achieved with the first DMARD strategy, in the absence of poor prognostic factors, change to another csDMARD strategy should be considered; when poor prognostic factors are present, addition of a bDMARD should be considered. Slightly reworded compared with 2010, this statement reiterates the unanimous view of the Task Force that risk stratification is an important aspect in the therapeutic approach to RA. These risks have been well defined over the years and include a high disease activity state, autoantibody positivity (rheumatoid factor and/or antibodies to citrullinated proteins) and the early presence of joint damage.102 ,103 In patients with a low risk of poor RA outcome, another csDMARD strategy (plus glucocorticoids) would be preferred, while in patients with a high risk, the addition of a bDMARD would be preferred. It should be noted that the Task Force changed the sequence compared with the 2010 recommendation, since it assumed that many patients may not be at high risk after a first DMARD strategy, especially in terms of a reduced disease activity and maybe even lower autoantibody levels, and that a rapid change of the csDMARD regimen within 6 months, in line with recommendation 3, may convey further efficacy for a significant proportion of patients. ‘Change’ rather than the previously used ‘switch’ is semantically more in line with potentially adding drugs, especially in patients initially treated with MTX monotherapy, and inherently also comprises switching. ‘Another conventional DMARD strategy’ has to be seen in relation to the first DMARD strategy; if the first DMARD was MTX monotherapy, then a switch to, or the addition of, other csDMARDs would be the appropriate choice; if the first DMARD strategy was combination therapy of MTX, sulfasalazine and hydroxychloroquine, then the next csDMARD strategy to choose in patients at low risk of poor outcome may be leflunomide, all of this under the proviso that optimal doses of the csDMARDs have already been used before (see above). The term ‘considered’ was used in both instances to reflect the Committee's preferences, but inherently acknowledges and implies that treatment decisions have to be made individually and that using a bDMARD after a first csDMARD also in a patient with lower risk of a poor outcome may be appropriate, just as using another csDMARD strategy in a patient at high risk of a poor outcome may be appropriate, as long as the target-oriented strategy to attain remission or low disease activity within 6 months remains paramount; the latter approach, indeed, may be a common or enforced approach in many healthcare systems. Studies suggesting that step-up csDMARD combination therapy was as effective as a step-up combination of a biological agent with MTX87 ,88 ,104 were seen to be in conflict with results from other studies showing better efficacy of addition of a bDMARD.89 Obviously, and for reasons of clarity, when speaking of csDMARDs, the Task Force had only the hitherto employed csDMARDs in mind and not any potential new targeted synthetic (ts) DMARD, such as a kinase inhibitor. In patients responding insufficiently to MTX and/or other csDMARD strategies, with or without glucocorticoids, bDMARDs (TNF inhibitors, abatacept or tocilizumab, and, under certain circumstances, rituximab) should be commenced with MTX. This point was approved as worded by 90% of the participants. First, the Task Force reiterated here that bDMARDs should primarily be started when patients did not achieve the therapeutic target after treatment with csDMARDs for 6 months (or had no improvement at 3 months). Second, it explicitly defined the agents it meant when mentioning ‘biological DMARDs’. In the 2010 recommendations, the Committee had added ‘current practice would be to start a TNF inhibitor’, and explained this expert opinion with the long-term use of TNF blockers and the availability of registry data when compared with abatacept and tocilizumab; this was simply an expression of a preference based on their larger and longer evidence base and was not intended to preclude use of other biological agents after csDMARD failures. Also, at that time, their application in patients with an inadequate response to csDMARDs was not yet approved for tocilizumab in the USA and for abatacept in Europe. Meanwhile, the approval status has changed for both drugs, the clinical experience with these agents has now grown for several years, and initial registry data do not seem to reveal differences in their safety profiles from the clinical trial data or when compared with TNF inhibitors.105–109 Moreover, a direct comparison of abatacept and adalimumab in patients with active disease despite MTX revealed very similar efficacy and overall safety.110 Therefore the Task Force decided by a 90% majority vote that no preference of one over another biological agent should be expressed in the 2013 update of the recommendations. However, the Task Force recognised that there was still more experience with TNF inhibitors than with other bDMARDs, and that more safety data from registries would be desirable for the newer bDMARDs. Notably, IL-1 inhibitors have not shown strong efficacy when compared with other bDMARDs in meta-analyses, so anakinra is not specifically mentioned in the abbreviated recommendation; nevertheless, some patients may respond to this bDMARD. Thirdly, the Task Force intentionally added ‘under certain circumstances rituximab’; while rituximab is approved for use after patients have responded insufficiently to TNF blockers, the Committee acknowledged that trial data in patients who were naïve for csDMARDs and those who had an inadequate response to csDMARDs have been published111 ,112 (level 1 evidence) and that, in the presence of certain contraindications for other agents—such as a recent history of lymphoma, latent tuberculosis (TB) with contraindications to the use of chemoprophylaxis, living in a TB-endemic region, or a previous history of demyelinating disease—rituximab may be considered as a first-line biological agent. Some rheumatologists also prioritise this drug in patients with a recent history of any malignancy, because there are no indications that rituximab use is associated with the occurrence of cancers113 ,114; furthermore, rituximab is the least expensive biological agent at present. Fourth, when speaking of TNF inhibitors, the Task Force listed the presently approved agents, adalimumab, certolizumab pegol, etanercept, golimumab and infliximab, but also decided to mention biosimilars under the proviso that they become approved in the USA and/or Europe; current data suggest that at least one biosimilar, CT-P13, has a similar efficacy and safety profile to the original antibody, infliximab, in RA and axial spondyloarthritis.115 ,116 Fifth, the Task Force felt that all bDMARDs should be used preferentially in combination with MTX or other csDMARDs. For neither TNF inhibitors nor rituximab or abatacept has monotherapy been consistently found to be superior to MTX alone, whereas combination therapy has; a dose of 10 mg MTX or more a week appears to be effective and appropriate for use with adalimumab and infliximab63 ,117 and, until proven otherwise, also with all other TNF inhibitors. Only tocilizumab has been repeatedly demonstrated to be superior as a monotherapy over MTX or other csDMARDs, although the Japanese study had an oplen label design and the MTX dose was low.118 ,119 In 2010, the Committee explicitly mentioned that a three-arm trial in early RA is needed to gain full insight, and, most recently, these data became available, albeit only in abstract form,120 revealing that only in combination with MTX tocilizumab (8 mg/kg) showed consistent significant superiority over MTX with regard to clinical, functional and structural outcomes. The other arms, tocilizumab monotherapy (8 mg/kg) and tocilizumab (4 mg/kg) in combination with MTX, showed superiority mainly in reaching the primary clinical end point (DAS28–erythrocyte sedimentation rate <2.6, a measure confounded by placing a high weight on acute phase reactant levels121), with only numeric differences in most of the clinical and functional secondary end points, most of which did not reach statistical significance. On the other hand, a head-to-head trial in patients with established RA who stopped MTX therapy revealed tocilizumab monotherapy to be superior to adalimumab monotherapy in most (though not all) endpoints.36 Thus, if biological monotherapy must be initiated, tocilizumab has some supportive evidence, but taken together, the data strongly support the use of all biological agents in combination with MTX. While clinical response is usually maintained even on withdrawal of MTX in patients receiving established therapy with MTX plus tocilizumab or a TNF inhibitor (and therefore presumably also other bDMARDs),122–124 there is rarely a reason to withdraw MTX, since, with established therapy, it is usually well tolerated. Also monotherapy is not a major recommendation by the Task Force, which clearly preferred maintenance of combination therapy. Finally, it is important to note that the Task Force agreed to abandon former recommendation No 14: ‘DMARD-naïve patients with poor prognostic markers might be considered for combination therapy of MTX plus a biological’. In 2010 it was already stated that early use of a biological agent should only be considered in exceptional patients; however, as it stood, this statement could have been misinterpreted as advocating use of biological agents even before an initial csDMARD strategy had failed. With the current decision, the use of bDMARDs before trying a csDMARD approach is even more strongly discouraged than signified by the 2010 recommendation. 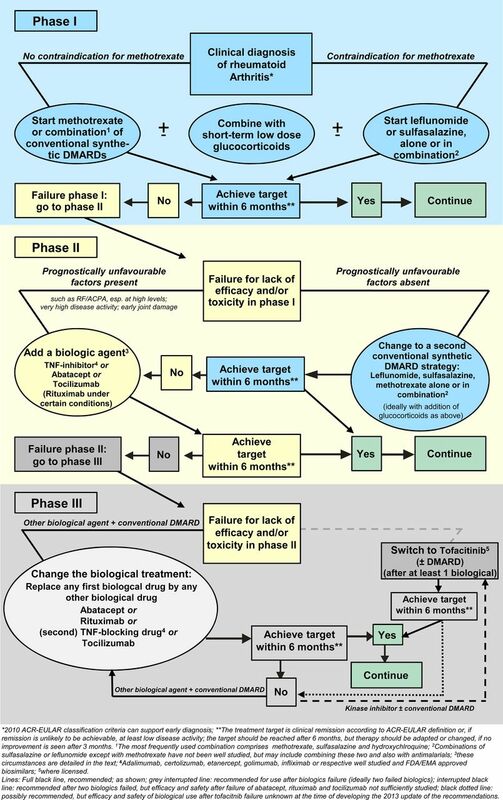 The majority of the current Committee members felt that using a treat-to-target strategy that gave patients the initial opportunity to respond to treatment in line with items 4, 5 and 7 still provides the option of adding a biological agent within 6 months—and thus quite early in the disease course or therapeutic chronology—if the treatment target was not reached. This approach was supported by several recent clinical trials.29 ,88 ,125 ,126 Although bDMARDs in comparison with csDMARDs in early disease confer a significant structural benefit, this benefit was deemed to be neither sufficiently large nor sufficiently frequent, provided that a treat-to-target strategy with treatment adaptations within 6 months was adhered to.125–127 This decision was probably the most heavily debated one: an initial ballot revealed a 94% majority for deleting the old recommendation No 14; subsequently, after thorough discussions, a re-voting process was solicited, but only 33% of the members voted for re-inclusion of old recommendation No 14. In this context it should be clarified that the Task Force was fully aware of the data in patients with early RA who have significantly higher response rates with bDMARDs combined with MTX than MTX alone; however, embedded within this responder population are good responders to MTX monotherapy who experience about 25% (or more) ACR70 improvement (corresponding to a low disease activity state including remission) across studies without any additional treatment adaptations being allowed over a 1-year trial period; in clinical practice, many of these patients would have been overtreated if they had received biological agents instead, placing them at a potentially increased risk of serious adverse events and incurring high costs. Also, it must be borne in mind that the BeSt study showed that csDMARDs plus glucocorticoids led to very similar initial clinical, functional and structural results as with bDMARDs,97 and the IMPROVED trial showed a very high rate of good outcomes using MTX plus low-dose glucocorticoids within a few months.60 Nevertheless, there may still be an exceptional patient in whom the use of a bDMARD in combination with MTX as the first DMARD strategy is considered appropriate. One can imagine patients whose professional or family life entirely depends on a rapid complete resolution of the joint symptoms and where glucocorticoids as adjunctive therapy with csDMARDs have failed or cannot be used because of contraindications. In such cases, the exceptional use of a biological agent is not precluded now that we have dismissed this recommendation from its former place in the table, but the prominence that could be misinterpreted has now been removed. Importantly, however, there are studies suggesting that early induction therapy with anti-TNF plus MTX may result in good outcomes even after withdrawal of the biological agent.128 ,129 Nevertheless, another study, although partly confirming these results, resulted in a relatively high relapse rate on withdrawal of the TNF inhibitor.130 Thus, more data are needed to support induction therapy, but further evidence confirming the maintenance of remission after withdrawal of the biological agent may lead to a paradigm change in our approach to treating RA (see item 12). If a first bDMARD has failed, patients should be treated with another bDMARD; if a first TNF inhibitor therapy has failed, patients may receive another TNF inhibitor or a biological agent with another mode of action. A consequence of item 9, recommendation 10 simply states that once the treatment target has not been reached with an initial biological therapy, other bDMARDs should be used; no preference is stated. The second part of this recommendation focusing on patients who have initially received a TNF inhibitor may seem somewhat redundant. However, it has two purposes: (i) to express the conclusion of the Task Force that current evidence does not suggest any one agent to be better than another TNF inhibitor when active disease prevails despite initial treatment with a TNF blocker; (ii) over the next few years, new biological agents targeting the IL-6 receptor (sarilumab) or IL-6 (clazakizumab, sirukumab) may become available131–133; without specific note on the options after failure of an initial TNF inhibitor therapy, one could infer that potentially approved new IL-6 inhibitors might be used after failure of tocilizumab, but in contrast with TNF inhibition, the efficacy of such an approach is currently unknown for IL-6 inhibition (or costimulation blockers or rituximab). Of note, with biosimilars approaching, it is self-evident that an infliximab biosimilar cannot be regarded as ‘another TNF inhibitor’ in patients with an insufficient response to infliximab. This recommendation was voted for by 97% of the members. Tofacitinib may be considered after biological treatment has failed. Tofacitinib, a JAK inhibitor, was approved for the treatment of RA in the USA, Japan and Russia at the time of the Task Force's meeting on 9 April 2013. For reasons stated above, an a priori decision had been made to address tofacitinib in the recommendations based on evidence of efficacy and safety available from the literature and accrued in the course of the respective SLR.13 Tofacitinib is not a bDMARD, but a synthetic chemical compound. It is a targeted molecule interfering with specific signal-transduction pathways and thus could not be subsumed within the term ‘conventional synthetic DMARDs’. Therefore the Task Force decided to address its use in a separate recommendation as a tsDMARD, rather than as part of csDMARDs or bDMARDs.2 The evidence from published papers and abstracts has convinced the Committee that tofacitinib is sufficiently efficacious in improving clinical, functional and structural outcomes to be considered a DMARD.134–136 The fact that the 5 mg dose approved in the USA and Japan just misses statistical significance for inhibition of joint damage progression compared with placebo at 12 months (p=0.06)137 did not preclude the Task Force from recognising its structural efficacy, given significant radiological differences at this dose in another trial.138 However, little is currently known about its long-term safety. Data from clinical trials reveal a numerical increase in serious infection rates compared with controls; herpes zoster infections in particular appear to be more common than seen with TNF inhibitors;134 ,139 several cases of TB and non-TB opportunistic infections have been reported; lymphocytopenia and anaemia also occur, and haemoglobin levels appear to increase less upon clinical improvement than seen with csDMARDs and bDMARDs. In light of the many available csDMARDs and bDMARDs that have long-standing clinical experience data, the Task Force felt that tofacitinib should primarily be used when bDMARDs have been insufficiently effective, even though it is already approved in the USA, Japan, Russia and meanwhile Switzerland for use after failure of csDMARDs. Indeed, the discussion initially focused on whether tofacitinib should only be recommended for use only after failure with two bDMARDs with different modes of action, but ultimately it was decided to just reflect this discussion item in the accompanying text and not in the recommendation. More clinical experience and safety data from registries, with a particular focus on serious infections, herpes zoster and malignancies, will be needed before the actual place of tofacitinib in the treatment sequence can be clarified, and at present the Committee did not feel that tofacitinib was safer or more efficacious than rituximab, which, according to currently existing labelling, should be used after TNF inhibitor failure. While the Task Force mainly focused on efficacy and safety, it also considered economic aspects, as supported by GRADE140 and as occurred in the 2010 recommendations when all recommendations were supported by cost-effectiveness data, with the exception of starting biological agents before sDMARDs.8 Given constrained healthcare budgets, the inefficient use of healthcare resources (ie, funding those interventions that are not cost-effective) often results in either a lost opportunity to improve the health of other individuals with cost-effective interventions or increased costs through taxes or insurance premiums. Hence the Committee noticed that the annual cost of tofacitinib in the USA and Switzerland is currently about US$25 000 and CHF25 000, respectively, placing it at a similar level to biological agents.141 ,142 Notably, the first biosimilar has been approved in Europe in the meantime143 ,144 and is expected to be priced at lower levels than the currently available bDMARDs.31 Therefore, although the Task Force appreciates that tofacitinib is an oral first-in-class drug with a different mechanism of action and is aware of the approval situation in the USA, Japan and other countries, it did not believe it was yet possible to conclude that tofacitinib has a similar safety profile to tocilizumab or other biological agents for which far more person-years of exposure have been accumulated and reported to date. Thus, additional long-term safety data and clinical experience will be needed to determine an overall benefit/harm ratio. Also, a proper cost-effectiveness analysis would be desirable. Accordingly, the Committee preferred not to recommend tofacitinib after MTX failure as it did for other biological agents. Among the Task Force members, 90% voted in favour of this recommendation as phrased here. Of particular importance, at the time of the Task Force's meeting on 9 April 2013, it was unknown when the EMA would release its decision on the approval of tofacitinib. Thus, the discussions, formulation of recommendation, explanatory stipulations and on-site voting of the Committee occurred before EMA published its first and second negative decision on tofacitinib (with resubmission being planned by the company).145–147 Anonymous voting on the level of agreement (strength of recommendation), however, occurred electronically after the first EMA decision became known and was the lowest of all items (7.6 on a scale of 0–10), which may have been influenced by this information. In cases of sustained long-term remission, cautious reduction of the csDMARD dose could be considered, as a shared decision between patient and physician. Except for minimal rewording (the term ‘titration’ is replaced by ‘reduction’), this item is identical with point 13 of the 2010 recommendations; it refers solely to those patients in whom glucocorticoids, if used, have already been stopped and/or who have attained and maintained the targeted therapeutic state on csDMARDs or those in whom bDMARDs have been successfully withdrawn (see above). This recommendation received 100% of the votes. As stated then, it must be borne in mind that stopping csDMARDs in patients with established RA in remission is followed by flares in about 70% of patients, twice as frequently as maintaining therapy irrespective of regimen.160 ,161 Therefore the focus of this item is on csDMARD reduction rather than cessation. On the other hand, drug-free remission may be an option in patients in whom therapy was initiated very early and who therefore also had achieved remission early in their disease course.162 Of note, in light of the availability of the ACR–EULAR remission definitions, the term ‘persistent remission’ in this recommendation primarily pertains to these definitions; however, formal DMARD withdrawal studies using them have not yet been performed. When therapy needs to be adjuusted, factors apart from disease activity, such as progression of structural damage, comorbidities and safety issues, should be taken into account. Again, this point is essentially identical with the last recommendation of 2010 and was unanimously approved at the Task Force meeting. It is intended to raise awareness that reaching the outcome of low disease activity or remission is not an absolute prerequisite and that it is equally important to account for comorbidities and other contraindications when targeting a good outcome. Conversely, high disease activity is typically associated with comorbidities,163 ,164 so effective therapeutic intervention may also prevent comorbidity.165–167 Finally, some patients with low disease activity may still develop seriously progressive radiographic joint damage, so after potential lag periods have been accounted for to recognise progression,168 such patients may then need intensification of therapy. Algorithm based on the 2013 European League Against Rheumatism recommendations on rheumatoid arthritis management. ACPA, anti-citrullinated protein antibody; DMARD, disease-modifying antirheumatic drug; RF, rheumatoid factor; TNF, tumour necrosis factor. The 2013 update of the EULAR RA management recommendations comprises three overarching principles and 14 recommendations. The overarching principles bring the patient into even closer focus than in 2010 by moving shared decision-making to become principle A. The Task Force now also regards all currently approved bDMARDs as being similarly effective (with the exception of anakinra) and generally safe for use as an initial biological therapy after csDMARD failure. While the 2010 Task Force had recognised a shortage of longer-term and, especially, registry data on non-TNF inhibitor biological agents, these have now become available to a sufficient extent to warrant this change. However, there is still a need for more observational/registry data for abatacept, rituximab and tocilizumab; there are still many fewer ‘real world’ safety data available for these three compounds than for the TNF inhibitors. The Task Force now also briefly addressed the use of bsDMARDs. Currently, data are available for one biosimilar infliximab poduct115 which shows similar efficacy and safety profiles to the original biological agent and was placed alongside the other TNF inhibitors in the therapeutic cascade; it is assumed that the price of this biosimilar will be significantly lower. Finally, the Task Force also dealt with the available data for tofacitinib.13 The abundance of efficacy data available has convinced the Task Force that tofacitinib at the twice daily 5 mg dose has clinical, functional and structural efficacy resembling that seen with bDMARDs; this may not be surprising given its pharmacological profile, namely inhibition of the JAK pathway, which is involved, among others, in IL-6 signalling. However, as detailed in the Results section, some safety aspects of tofacitinib are of concern and precluded recommendation of its use before the failure of at least one and preferably two biological agents, since many bDMARDs are currently available on the market and familiar to rheumatologists. In the absence of a cost-effectiveness analysis, the Task Force was also concerned about the remarkably high price in the USA (and meanwhile also in Switzerland).141 ,142 While the Task Force's major focus was and should be efficacy and safety of available therapies, it did not ignore its own overarching principle C, which includes cost considerations of medications in general and in its own therapeutic recommendations, as evidenced by inclusion of a health economist in the Task Force. Thus, the current recommendation for the first tsDMARD considers its entire net profile (risk/benefit/costs); this aspect was also addressed for other therapies, especially boDMARDs, in 2010.3 ,8 However, it is evident that economic approaches will differ between countries depending on their healthcare systems. This recommendation was voted on while the Task Force had knowledge about the US label and literature on tofacitinib, but before the negative opinion of EMA became known. Finally, tapering bDMARDs was addressed, as new data had become available (item 12) that suggest that, once low disease activity and, especially, remission is sustained, a dose reduction of bDMARDs will allow maintenance of the good outcome. The Task Force did not address issues of immunogenicity reported for some but not other bDMARDs, since the SLRs performed did not reveal any significant differences in efficacy among the different bDMARDs and also since agents that induce drug antibodies were not shown to convey worse outcome than agents that do not.171 In addition, although there are data available that suggest that baseline TNF levels may predict response to TNF inhibitor therapy,150 the Task Force did not focus on predictors of response and regarded this aspect as part of the research agenda. Thus, looking at the major changes in comparison with the 2010 recommendations,3 this update placed combination therapy of csDMARDs at the same level as MTX monotherapy as a first-line DMARD strategy (in addition to its potential use as a second csDMARD strategy after insufficient efficacy of MTX in patients without adverse prognostic markers), all preferably in combination with glucocorticoids. For the use of biological agents as a second-line DMARD strategy in patients with adverse prognostic signs, a preference for TNF inhibitors is no longer maintained, and the use of bDMARDs in combination with csDMARDs is generally advocated. Further, biosimilars and tofacitinib are addressed. Compared with the 2012 update of the ACR management recommendations,172 the EULAR update is of a more general nature and avoids discussing individual case scenarios, focuses less on safety aspects (which are covered in the respective SLR and are widely available in the respective package inserts), addresses glucocorticoids, disregards minocycline, does not advocate the use of biological agents as monotherapy or part of the initial treatment strategy, places tocilizumab at the same level as other biological agents, and also discusses tofacitinib and biosimilars. One of the most important aspects in the context of developing recommendations or guidelines is their implementation173 and actual application. Implementation is a multistep procedure, which benefits from the adoption of international recommendations by local societies, as was the case for the 2010 EULAR recommendations.9–12 Nevertheless, adoption of therapeutic targets and means to reach these targets in clinical practice have been shown to be far from ideal,174 and, in a very recent analysis of the implementation of guidelines and recommendations across Europe, there was some room for further improvement.175 Thus, it will clearly be a challenge for EULAR to ensure and find ways to monitor whether these updated recommendations are at least considered widely in clinical care. The 2013 update of the EULAR recommendations was developed by a Task Force consisting of 33 members from 11 European countries and the USA; among them were four patients, an infectious disease specialist and a health economist. While it may be seen to be a limitation that the rheumatologists of the Task Force came only from Europe and none was from the USA, Japan or other countries, it is important to state that most of these recommendations are based on a large body of evidence and only a few reflect elements of expert opinion (see also table 2). Even if these recommendations are regarded to reflect primarily a European view, they can be used as a template for slightly amended versions by other national or international rheumatological societies outside Europe, as has, indeed, been the case with the 2010 recommendations.9 ,10 The recommendations are intended to assist and inform rheumatologists, patients, hospital managers, representatives of social security agencies, regulatory authorities and government officials. Although some of the medications discussed are not yet licensed at all or in all countries, they are expected to receive this status in due course, and sufficient literature was available to address them accordingly. Importantly, most of the recommendations have a very high level of evidence, received a large majority vote, and have a high strength of recommendation. Nevertheless, some items were developed just by expert opinion or comprise a mixture of high evidence level and expert opinion, and this drove the research agenda presented in box 1. It is rewarding to see that some of the items of the research agenda presented in 2010 (eg, items 2, 4, 6)3 have already been partly or fully addressed and this, indeed, informed the current update. After insufficient response to MTX, is step-up therapy using a combination of csDMARDs as efficacious as step-up therapy using a bDMARD? Such trials should be thoroughly performed by defining an appropriate end point, adhering to the a priori primary end point, and recruiting/evaluating sufficient numbers of patients in accordance with the original power calculation. Can triple therapy with MTX, sulfasalazine and hydroxychloroquine be regarded as a treatment with ‘three different DMARDs’ or is it just a ‘single DMARD strategy’? What is the most successful tapering strategy of glucocorticoids after bridging or longer-term therapy? What is the balance of benefit/harm of long-term (>6 months) treatment with glucocorticoids at doses up to 10 mg/day in established RA? How long can low-dose glucocorticoids be applied with benefit and without causing harm? How do biological agents plus MTX compare with MTX plus low-dose glucocorticoids in patients with early RA? Is induction therapy with bDMARDs plus MTX as a first treatment strategy followed by withdrawal of the biological agent after 6–12 months as promising an option for abatacept and tocilizumab as it appears to be for TNF inhibitors, and can therefore an induction regimen with bDMARDs plus MTX become a new therapeutic paradigm? With respect to the efficacy and safety of tofacitinib, can biological agents be safely used after tofacitinib (with or without a washout period) and can tofacitinib be safely and effectively used after abatacept, rituximab and tocilizumab? How comparable are the different biological agents to each other and to tofacitinib? Are there, aside from rituximab, differences in responsiveness to bDMARDs between seropositive and seronegative patients? Is there a difference between reducing dose and increasing interval when tapering biological agents after the targeted state has been reached? Is it correct that, when patients have not reached the target on MTX, those with risk factors for bad outcome benefit more from the addition of a biological agent than from switching to or addition of csDMARDs? Is it correct that, when patients have not reached the target on MTX, those with no risk of bad outcome benefit equally from switching to or addition of csDMARDs as they would from addition of a biological agent? Can we find common or specific predictors of response to the different biological agents, csDMARDs and tsDMARDs? What are the risk factors that define patients who benefit from a more intensive initial treatment modality? Which factors predict who will be able to successfully withdraw bDMARDs and who not? How big is the difference in clinical, functional and structural efficacy when treatment strategies aiming to achieve remission are compared with those aiming to achieve low disease activity? How can immunogenicity of bDMARDs explain the similarity of clinical trial data observed with both immunogenic and non-immunogenic compounds? How good is patient adherence to biological agents and can lack of adherence be related to loss of efficacy? Is measurement of serum drug and/or drug antibody levels useful in clinical practice? Which degree of improvement is needed at 3 months to ensure reaching the treatment target at 6 months and beyond? How long should we aim to use concomitant GC therapy in RA? To understand more in detail how the molecular mechanisms of genomic and non-genomic GC actions (and their dose dependency!) mediate the clinically wanted benefits but also the known adverse effects. To improve treatment with conventional GCs (eg, in respect of timing and circadian rhythms) and develop innovative GC or novel GC receptor ligands. To evaluate further possibilities to reduce the (subjective) adverse events of MTX, the anchor drug in treating RA. Long-term safety data in real life (registries) are needed for non-TNF inhibitor biological agents and tofacitinib. Is tocilizumab monotherapy as efficacious and safe as other bDMARDs plus MTX? Can bDMARDs and/or sDMARDs be safely withdrawn in patients with established disease who have long-standing (>6 months) remission according to the ACR–EULAR definition? ACR, American College of Rheumatology; bDMARD, biological DMARD; csDMARD, conventional synthetic DMARD; DMARD, disease-modifying antirheumatic drug; EULAR, European League against Rheumatism; GC, ; MTX, methotrexate; RA, rheumatoid arthritis; TNF, tumour necrosis factor; tsDMARD, targeted synthetic DMARD. The 2013 update of the EULAR recommendations provides the current state of thinking in the field of RA management from a mainly European perspective. The updated recommendations comprise the synthesis of available information based primarily on efficacy and safety of the agents addressed, with inclusion of some health economic considerations. They should enable optimal outcomes in our patients. However, a significant proportion of patients may still not reach the desired therapeutic target. Therefore new therapies are still needed and, indeed, are on the horizon. Also, some items will need to be further developed in the context of future research activities. Consequently, we will carefully follow the developments in the field and anticipate that yet another update may be needed in 2–3 years. Until then, we hope that the current recommendations will find their way into clinical practice either directly or through national societies that may wish to use them as a framework for development of local guidance documents. We would like to thank the European League Against Rheumatism (EULAR) for providing the funds to perform this task.
. New therapies for the treatment of rheumatoid arthritis. Lancet 2007;370:1861–74.
. Proposal for a new nomenclature of disease-modifying antirheumatic drugs. Ann Rheum Dis 2014;73:3–5.
. Current evidence for the management of rheumatoid arthritis with synthetic disease-modifying antirheumatic drugs: a systematic literature review informing the EULAR recommendations for the management of rheumatoid arthritis. Ann Rheum Dis 2010;69:1004–9.
. Current evidence for the management of rheumatoid arthritis with biological disease-modifying antirheumatic drugs: a systematic literature review informing the EULAR recommendations for the management of RA. Ann Rheum Dis 2010;69:976–86.
. Current evidence for the management of rheumatoid arthritis with glucocorticoids: a systematic literature review informing the EULAR recommendations for the management of rheumatoid arthritis. Ann Rheum Dis 2010;69:1010–14.
. Current evidence for a strategic approach to the management of rheumatoid arthritis with disease-modifying antirheumatic drugs: a systematic literature review informing the EULAR recommendations for the management of rheumatoid arthritis. Ann Rheum Dis 2010;69:987–94.
. Economic aspects of treatment options in rheumatoid arthritis: a systematic literature review informing the EULAR recommendations for the management of rheumatoid arthritis. Ann Rheum Dis 2010;69:995–1003.
. Management of rheumatoid arthritis: consensus recommendations from the Hong Kong Society of Rheumatology. Clin Rheumatol 2011;30:303–12.
. Suboptimal management of rheumatoid arthritis in the Middle East and Africa: could the EULAR recommendations be the start of a solution?. Clin Rheumatol 2013;32:151–9.
. The new 2012 German recommendations for treating rheumatoid arthritis : differences compared to the European standpoint. Z Rheumatol 2013;72:6–9.
. Canadian Rheumatology Association recommendations for pharmacological management of rheumatoid arthritis with traditional and biologic disease-modifying antirheumatic drugs. J Rheumatol 2012;39:1559–82.
. Efficacy of conventional synthetic disease-modifying antirheumatic drugs, glucocorticoids and tofacitinib—a systematic literature review informing the 2013 update of the EULAR recommendations for management of rheumatoid arthritis. Ann Rheum Dis 2014;73:510–15.
. 2013 update of the evidence for the management of rheumatoid arthritis with biological disease-modifying antirheumatic drugs: a systematic literature review informing the EULAR recommendations for the management RA. Ann Rheum Dis 2013; submitted.
. Safety of synthetic and biological DMARDs—a systematic literature review informing the 2013 update of the EULAR recommendations for management of rheumatoid arthritis. Ann Rheum Dis 2013; submitted.
. Quality care in seniors with new-onset rheumatoid arthritis: a Canadian perspective. Arthritis Care Res (Hoboken) 2011;63:53–7.
. Factors associated with the initiation of disease-modifying antirheumatic drugs in newly diagnosed rheumatoid arthritis: a retrospective claims database study. Clin Ther 2012;34:457–67.
. EULAR recommendations for the role of the nurse in the management of chronic inflammatory arthritis. Ann Rheum Dis 2012;71:13–19.
. EULAR evidence-based recommendations for cardiovascular risk management in patients with rheumatoid arthritis and other forms of inflammatory arthritis. Ann Rheum Dis 2010;69:325–31.
. The burden of rheumatoid arthritis and access to treatment: health burden and costs. Eur J Health Econ 2008;8(Suppl 2):S49–60.
. Disability-adjusted life years (DALYs) for 291 diseases and injuries in 21 regions, 1990–2010: a systematic analysis for the Global Burden of Disease Study 2010. Lancet 2012;380:2197–223.
. Years lived with disability (YLDs) for 1160 sequelae of 289 diseases and injuries 1990–2010: a systematic analysis for the Global Burden of Disease Study 2010. Lancet 2012;380:2163–96.
. The burden of rheumatoid arthritis and access to treatment: outcome and cost-utility of treatments. Eur J Health Econ 2008;8(Suppl 2):S95–106.
. Swedish Hip reaplecement Register—Annual Report 2006. 2008. http://www.jruorthopguse/ (accessed 23 Aug 2008).
. Comparative effectiveness and safety of biological treatment options after tumour necrosis factor alpha inhibitor failure in rheumatoid arthritis: systematic review and indirect pairwise meta-analysis. Ann Rheum Dis 2012.
. Addition of infliximab compared with addition of sulfasalazine and hydroxychloroquine to methotrexate in patients with early rheumatoid arthritis (Swefot trial): 1-year results of a randomised trial. Lancet 2009;374:459–66.
. A decrease in disease activity score (DAS) level is associated with a decrease in health assessment questionnaire (HAQ) score, independent of follow-up duration, during 5 years of tightly controlled treatment: results from the BeSt study. Ann Rheum Dis 2011;70:168–71.
. The role of biosimilars in the treatment of rheumatic diseases. Ann Rheum Dis 2013;72:322–8.
. Performance of the 2010 ACR/EULAR classification criteria for rheumatoid arthritis: a systematic literature review. Ann Rheum Dis 2013.
. Treating rheumatoid arthritis to target: recommendations of an international task force. Ann Rheum Dis 2010; 69:631–7.
. American College of Rheumatology/European League Against Rheumatism provisional definition of remission in rheumatoid arthritis for clinical trials. Ann Rheum Dis 2011;70:404–13.
. Clinical, functional and radiographic consequences of achieving stable low disease activity and remission with adalimumab plus methotrexate or methotrexate alone in early rheumatoid arthritis: 26-week results from the randomised, controlled OPTIMA study. Ann Rheum Dis 2013;72:64–71.
. Tocilizumab monotherapy versus adalimumab monotherapy for treatment of rheumatoid arthritis (ADACTA): a randomised, double-blind, controlled phase 4 trial. Lancet 2013;381:1541–50.
. Assessing remission in clinical practice. Rheumatology 2007;46:975–9.
. Association with joint damage and physical functioning of nine composite indices and the 2011 ACR/EULAR remission criteria in rheumatoid arthritis. Ann Rheum Dis 2011;70:1815–21.
. Being in remission or in low disease activity in rheumatoid arthritis: different meaning with the use of different composite scores. Arthritis Rheum 2009;60(Suppl):957.
. Radiographic changes in rheumatoid arthritis patients attaining different disease activity states with methotrexate monotherapy and infliximab plus methotrexate: the impacts of remission and TNF-blockade. Ann Rheum Dis 2009;68:823–7.
. Joint damage in rheumatoid arthritis progresses in remission according to the Disease Activity Score in 28 joints and is driven by residual swollen joints. Arthritis Rheum 2011;63:3702–11.
. Superiority of SDAI over DAS-28 in assessment of remission in rheumatoid arthritis patients using power Doppler ultrasonography as a gold standard. Rheumatology (Oxford) 2010;49:683–90.
. In patients with early rheumatoid arthritis, the new ACR/EULAR definition of remission identifies patients with persistent absence of functional disability and suppression of ultrasonographic synovitis. Ann Rheum Dis 2013;72:245–9.
. Sonographic joint assessment in rheumatoid arthritis: Associations with clinical joint assessment in remission. Arthritis Rheum 2013.
. Reporting disease activity in clinical trials of patients with rheumatoid arthritis: EULAR/ACR collaborative recommendations. Ann Rheum Dis 2008;67:1360–4.
. Comorbidity affects all domains of physical function and quality of life in patients with rheumatoid arthritis. Rheumatology (Oxford) 2011;50:381–8.
. Outcome in rheumatoid arthritis patients with continued conventional therapy for moderate disease activity—the early RA network (ERAN). Rheumatology (Oxford) 2011;50:926–31.
. Disease-modifying anti-rheumatic drug usage, prescribing patterns and disease activity in rheumatoid arthritis patients in community-based practice. Intern Med J 2011;41:450–5.
. Disease activity early in the course of treatment predicts response to therapy after one year in rheumatoid arthritis patients. Arthritis Rheum 2007;56:3226–35.
. Optimal dosage and route of administration of methotrexate in rheumatoid arthritis: a systematic review of the literature. Ann Rheum Dis 2009;68:1094–9.
. Definition of treatment response in rheumatoid arthritis based on the simplified and the clinical disease activity index. Ann Rheum Dis 2012;71:1190–6.
. Validation of rheumatoid arthritis improvement criteria that include simplified joint counts. Arthritis Rheum 1998;41:1845–50.
. Methotrexate as the “anchor drug” for the treatment of early rheumatoid arthritis. Clin Exp Rheumatol 2003;21(Suppl 31):S178–85.
. The importance of reporting disease activity states in clinical trials of rheumatoid arthritis. Arthritis Rheum 2008;58:2622–31.
. The PREMIER study—A multicenter, randomized, double-blind clinical trial of combination therapy with adalimumab plus methotrexate versus methotrexate alone or adalimumab alone in patients with early, aggressive rheumatoid arthritis who had not had previous methotrexate treatment. Arthritis Rheum 2006;54:26–37.
. Inhibition of joint damage and improved clinical outcomes with rituximab plus methotrexate in early active rheumatoid arthritis: the IMAGE trial. Ann Rheum Dis 2011;70:39–46.
. Effect of folic or folinic acid supplementation on the toxicity and efficacy of methotrexate in rheumatoid arthritis: a forty-eight week, multicenter, randomized, double-blind, placebo-controlled study. Arthritis Rheum 2001;44:1515–24.
. Long-term safety of methotrexate monotherapy in patients with rheumatoid arthritis: a systematic literature research. Ann Rheum Dis 2009;68:1100–4.
. Efficacy, pharmacokinetics, and safety of different doses of methotrexate in combination with adalimumab: results from the CONCERTO trial. Ann Rheum Dis 2013;72(Suppl 3):72.
. Efficacy and toxicity of methotrexate (MTX) monotherapy versus MTX combination therapy with non-biological disease-modifying antirheumatic drugs in rheumatoid arthritis: a systematic review and meta-analysis. Ann Rheum Dis 2009;68:1105–12.
. Effects of hydroxychloroquine and sulphasalazine on progression of joint damage in rheumatoid arthritis. Lancet 1989;1:1036–8.
. Efficacy and safety of leflunomide compared with placebo and sulphasalazine in active rheumatoid arthritis: a double-blind, randomised, multicentre trial. Lancet 1999;353:259–66.
. Treatment with leflunomide slows radiographic progression of rheumatoid arthritis. results from three randomized controlled trials of leflunomide in patients with active rheumatoid arthritis. Arthritis Rheum 2000;43:495–505.
. Treatment of active rheumatoid arthritis with leflunomide compared with placebo and methotrexate. Arch Int Med 1999;159:2542–50. Ref Type: Generic.
. Combination therapy in early rheumatoid arthritis: a randomised, controlled, double blind 52 week clinical trial of sulphasalazine and methotrexate compared with the single components. Ann Rheum Dis 1999;58:220–5.
. Adalimumab alone and in combination with disease-modifying antirheumatic drugs for the treatment of rheumatoid arthritis in clinical practice: the Research in Active Rheumatoid Arthritis (ReAct) trial. Ann Rheum Dis 2007;66:732–9.
. Comparative effectiveness of tumour necrosis factor alpha inhibitors in combination with either methotrexate or leflunomide. Ann Rheum Dis 2009;68:1856–62.
. Long-term usage and side-effect profile of sulphasalazine in rheumatoid arthritis. Br J Rheumatol 1995; 34(Suppl 2):40–2.
. Clinical efficacy of sulphasalazine—a review. Br J Rheumatol 1995;34(Suppl 2):35–9.
. Sulphasalazine in the treatment of rheumatoid arthritis: relationship of dose and serum levels to efficacy. Br J Rheumatol 1985;24:269–76. Food and Drug Administration. Azulfidine EN-tabs. 2012. http://www.accessdata.fda.gov/drugsatfda_docs/label/2012/007073s125lbl.pdf (accessed 7 Sep2013).
. Clinical evaluation of the efficacy of the P2X7 purinergic receptor antagonist AZD9056 on the signs and symptoms of rheumatoid arthritis in patients with active disease despite treatment with methotrexate or sulphasalazine. Ann Rheum Dis 2012;71:1630–5.
. Management of RA medications in pregnant patients. Nat Rev Rheumatol 2009;5:382–90.
. Evidence from clinical trials and long-term observational studies that disease-modifying anti-rheumatic drugs slow radiographic progression in rheumatoid arthritis: updating a 1983 review. Rheumatology (Oxford) 2002;41:1346–56.
. Re-evaluation of antimalarials in treating rheumatic diseases: re-appreciation and insights into new mechanisms of action. Curr Opin Rheumatol 2011;23:278–81.
. Hydroxychloroquine use and decreased risk of diabetes in rheumatoid arthritis patients. J Clin Rheumatol 2011;17:115–20.
. Hydroxychloroquine use associated with improvement in lipid profiles in rheumatoid arthritis patients. Arthritis Care Res (Hoboken) 2011;63:530–4.
. Comparison of effects of two antimalarial agents, hydroxychloroquine sulfate and chloroquine phosphate, in patients with rheumatoid arthitis. Cleve Clin Q 1957;24:98–104.
. Current evidence for the management of rheumatoid arthritis with synthetic disease modifying antirheumatic drugs: A systematic literature review informing the EULAR recommendations for the management of rheumatoid arthritis. Ann Rheum Dis 2010;69:1004–9.
. Conventional combination treatment versus biological treatment in methotrexate-refractory early rheumatoid arthritis: 2 year follow-up of the randomised, non-blinded, parallel-group Swefot trial. Lancet 2012;379:1712–20.
. Induction therapy with a combination of DMARDs is better than methotrexate monotherapy: first results of the tREACH trial. Ann Rheum Dis 2013;72:72–8.
. A randomized comparative effectiveness study of oral triple therapy versus etanercept plus methotrexate in early aggressive rheumatoid arthritis: the treatment of Early Aggressive Rheumatoid Arthritis Trial. Arthritis Rheum 2012;64:2824–35.
. Infliximab for 6 months added on combination therapy in early rheumatoid arthritis: 2-year results from an investigator-initiated, randomised, double-blind, placebo-controlled study (the NEO-RACo Study). Ann Rheum Dis 2013;72:851–7.
. Therapies for Active Rheumatoid Arthritis after Methotrexate Failure. N Engl J Med 2013;369:307–18.
. The impact of four dynamic, goal-steered treatment strategies on the 5-year outcomes of rheumatoid arthritis patients in the BeSt study. Ann Rheum Dis 2011;70:1039–46.
. Randomized comparison of triple DMARD therapy with methotrexate mono-therapy. Ann Rheum Dis 2013;72(Suppl 3):113.
. Similar effects of disease-modifying antirheumatic drugs, glucocorticoids, and biologic agents on radiographic progression in rheumatoid arthritis: meta-analysis of 70 randomized placebo-controlled or drug-controlled studies, including 112 comparisons. Arthritis Rheum 2010;62:2852–63.
. Low-Dose Prednisone Inclusion in a Methotrexate-Based, Tight Control Strategy for Early Rheumatoid Arthritis: A Randomized Trial. Ann Intern Med 2012;156:329–39.
. Standardised nomenclature for glucocorticoid dosages and glucocorticoid treatment regimens: current questions and tentative answers in rheumatology. Ann Rheum Dis 2002;61:718–22.
. Low-dose prednisolone in addition to the initial disease-modifying antirheumatic drug in patients with early active rheumatoid arthritis reduces joint destruction and increases the remission rate: a two-year randomized trial. Arthritis Rheum 2005;52:3360–70.
. COBRA combination therapy in patients with early rheumatoid arthritis: long-term structural benefits of a brief intervention. Arthritis Rheum 2002;46:347–56.
. Very low-dose prednisolone in early rheumatoid arthritis retards radiographic progression over two years: a multicenter, double-blind, placebo-controlled trial. Arthritis Rheum 2005;52:3371–80.
. The effect of glucocorticoids on joint destruction in rheumatoid arthritis. The Arthritis and Rheumatism Council Low-Dose Glucocorticoid Study Group. N Engl J Med 1995;333:142–6.
. Are glucocorticoids DMARDs? Ann N Y Acad Sci 2006;1069:268–74.
. Safety of low dose glucocorticoid treatment in rheumatoid arthritis: published evidence and prospective trial data. Ann Rheum Dis 2006;65:285–93.
. EULAR evidence-based recommendations on the management of systemic glucocorticoid therapy in rheumatic diseases. Ann Rheum Dis 2007;66:1560–7.
. A pilot risk model for the prediction of rapid radiographic progression in rheumatoid arthritis. Rheumatology (Oxford) 2009;48:1114–21.
. A matrix risk model for the prediction of rapid radiographic progression in patients with rheumatoid arthritis receiving different dynamic treatment strategies: post hoc analyses from the BeSt study. Ann Rheum Dis 2010;69:1333–7.
. Two-year radiographic results from the TEAR trial. Arthritis Rheum 2010;62(Suppl):S568–9.
. Prospective follow-up of tocilizumab treatment in 1100 patients with refractory rheumatoid arthritis: tolerance data from the french registry regate (registry–roactemra). Ann Rheum Dis 2013;72(Suppl 3):456.
. Retention of tocilizumab and anti-tumour necrosis factor drugs in the treatment of rheumatoid arthritis. Scand J Rheumatol 2013;42:253–9.
. Abatacept and its use in the treatment of rheumatoid arthritis (RA) in the Czech Republic-data from the ATTRA registry. Clin Rheumatol 2013;32:1451–8.
. Risk factors for severe infections in patients with rheumatoid arthritis treated with rituximab in the autoimmunity and rituximab registry. Arthritis Rheum 2010;62:2625–32.
. Safety of surgery after rituximab therapy in 133 patients with rheumatoid arthritis: Data from the AutoImmunity and Rituximab registry. Arthritis Care Res (Hoboken) 2013. doi:10.1002/acr.22056. [Epub ahead of print 10 Jun 2013].
. Head-to-head comparison of subcutaneous abatacept versus adalimumab for rheumatoid arthritis: findings of a phase IIIb, multinational, prospective, randomized study. Arthritis Rheum 2013;65:28–38.
. Updated consensus statement on the use of rituximab in patients with rheumatoid arthritis. Ann Rheum Dis 2011;70:909–20.
. Risk of cancer recurrence or new tumors in RA patients with prior malignancies treated with various biologic agents. Arhritis Rheum 2013; (ACR 2013 Abstract online (https://ww2.rheumatology.org/apps/MyAnnualMeeting/Abstract/36584).
. A randomised, double-blind, parallel-group study to demonstrate equivalence in efficacy and safety of CT-P13 compared with innovator infliximab when coadministered with methotrexate in patients with active rheumatoid arthritis: the PLANETRA study. Ann Rheum Dis 2013;72:1613–20.
. A randomised, double-blind, multicentre, parallel-group, prospective study comparing the pharmacokinetics, safety, and efficacy of CT-P13 and innovator infliximab in patients with ankylosing spondylitis: the PLANETAS study. Ann Rheum Dis 2013;72:1605–12.
. Methotrexate reduces immunogenicity in adalimumab treated rheumatoid arthritis patients in a dose dependent manner. Ann Rheum Dis 2012;71:1914–5.
. Comparison of tocilizumab monotherapy versus methotrexate monotherapy in patients with moderate to severe rheumatoid arthritis: the AMBITION study. Ann Rheum Dis 2010;69:88–96.
. Tocilizumab (TCZ) in combination and monotherapy versus methotrexate (MTX) in MTX-naive patients (pts) with early rheumatoid arthritis (RA): clinical and radiographic outcomes from a randomised, placebo-controlled trial. Ann Rheum Dis 2013;72(Suppl):OP041.
. Tight control in the treatment of rheumatoid arthritis: efficacy and feasibility. Ann Rheum Dis 2007;66(Suppl 3):iii56–60.
. Adding tocilizumab or switching to tocilizumab monotherapy in methotrexate inadequate responders: 24-week symptomatic and structural results of a 2-year randomised controlled strategy trial in rheumatoid arthritis (ACT-RAY). Ann Rheum Dis 2013;72:43–50.
. Combination etanercept and methotrexate provides better disease control in very early (<=4 months) versus early rheumatoid arthritis (>4 months and <2 years): post hoc analyses from the COMET study. Ann Rheum Dis 2012;71:989–92.
. Efficacy and safety of combination etanercept and methotrexate versus etanercept alone in patients with rheumatoid arthritis with an inadequate response to methotrexate: the ADORE study. Ann Rheum Dis 2006;65:1478–83.
. Evaluation of two strategies (initial methotrexate monotherapy vs its combination with adalimumab) in management of early active rheumatoid arthritis: data from the GUEPARD trial. Rheumatology (Oxford) 2009;48:1429–34.
. Long-Term Outcomes of Early Rheumatoid Arthritis Patients Initiated with Adalimumab Plus Methotrexate Compared with Methotrexate Alone Following a Targeted Treatment Approach. Arthritis Rheum 2012;64(Suppl):S335–6.
. Treating Rheumatoid Arthritis to Target: Outcomes and Predictors in Early Rheumatoid Arthritis Patients Treated with Adalimumab Plus Methotrexate, Methotrexate Alone, or Methotrexate Plus Subsequent Adalimumab. Arthritis Rheum 2011;63(Suppl):S665. Ref Type: Abstract.
. Withrawal of adalimumab in early rheumatoid arthritis patients who attained stable low disease activity with adalimumab plus methotrexate: esults of a phase 4, double-blind, placebo-controlled trial. Rheumatology (Oxford) 2012;51(Suppl 3):iii27.
. Induction therapy with adalimumab plus methotrexate for 24 weeks followed by methotrexate monotherapy up to week 48 versus methotrexate therapy alone for DMARD-naive patients with early rheumatoid arthritis: HIT HARD, an investigator-initiated study. Ann Rheum Dis 2013;72:844–50.
. Assessing maintenance of remission with reduced dose etanercept plus methotrexate, methotrexate alone, or placebo in patients with early rheumatoid arthritis who achieved remission with etanercept and methotrextate: the PRIZE study. Ann Rheum Dis 2013;72(Suppl 3):399.
. Sarilumab for the treatment of moderate-to-severe rheumatoid arthritis: results of a phase 2, randomized, double-blind, placebo-controlled, international study. Ann Rheum Dis 2012;71(Suppl 3):60. Ref Type: Abstract.
. Results from a 2-part, proof-of-concept, dose-ranging, randomized, double-blind, placebo-controlled, phase 2 study of sirukumab, a human anti-interleukin-6 monoclonal antibody, in active rheumatoid arthritis patients despite methotrexate therapy. Arthritis Rheum 2011;63(Suppl):S1034. Ref Type: Journal (Full).
. A phase II, double-blind, randomised, placebo-controlled study of BMS945429 (ALD518) in patients with rheumatoid arthritis with an inadequate response to methotrexate. Ann Rheum Dis 2012;71:1183–9.
. Tofacitinib or adalimumab versus placebo in rheumatoid arthritis. N Engl J Med 2012;367:508–19.
. Tofacitinib (CP-690,550) in combination with methotrexate in patients with active rheumatoid arthritis with an inadequate response to tumour necrosis factor inhibitors: a randomised phase 3 trial. Lancet 2013;381:451–60.
. Placebo-controlled trial of tofacitinib monotherapy in rheumatoid arthritis. N Engl J Med 2012;367:495–507.
. Tofacitinib (CP-690,550) in patients with rheumatoid arthritis on methotrexate: 12-Month data from a 24-month Phase 3 randomized radiographic study. Arthritis Rheum 2013;65:559–70.
. Radiographic, Clinical and Functional Comparison of Tofacitinib Monotherapy Versus Methotrexate in Methotrexate-Nave Patients with Rheumatoid Arthritis. Arthritis Rheum 2012;64(Suppl):S1049.
. Association between the initiation of anti-tumor necrosis factor therapy and the risk of herpes zoster. JAMA 2013;309:887–95.
. Incorporating considerations of resources use into grading recommendations. BMJ 2008;336:1170–3.
. Pfizer's first-in-class JAK inhibitor pricey for rheumatoid arthritis market. Nat Biotechnol 2013;31:3–4. Xeljanz Filmtbl 5mg (iH 08/13). 2013. http://www.kompendium.ch/prod/pnr/1234138/de. European Medicines Agency-CHMP. Summary of Opinion (Infliximab biosimilar). 2013. http://www.ema.europa.eu/docs/en_GB/document_library/Summary_of_opinion_-_Initial_authorisation/human/002576/WC500144832.pdf,editors. Ref Type: Online Source. European Medicines Agency. European Medicines Agency recommends approval of first two monoclonal antibody biosimilars. 2013. http://www.ema.europa.eu/docs/en_GB/document_library/Press_release/2013/06/WC500144941.pdf. Ref Type: Online Source. European Medical Agency. Xeljanz. 2013. http://www.ema.europa.eu/ema/indexjsp?curl=pages/medicines/human/medicines/002542/smops/Negative/human_smop_000501jsp&mid=WC0b01ac058001d127 (accessed 25 May, 2014). Committee for Medicinal Products for Human Use (CHMP). Meeting highlights from the Committee for Medicinal Products for Human Use (CHMP). 22–25 July 2013. http://www.ema.europa.eu/ema/index.jsp?curl=pages/news_and_events/news/2013/07/news_detail_001851.jsp&mid=WC0b01ac058004d5c1. Pfizer. Pfizer Receives CHMP Negative Opinion Regarding Marketing Authorization In Europe For Rheumatoid Arthritis Treatment XELJANZ (tofacitinib citrate). 2013. http://press.pfizer.com/press-release/pfizer-receives-chmp-negative-opinion-regarding-marketing-authorization-europe-rheumat (accessed 25 May 2013).
. Discontinuation of biologics in patients with rheumatoid arthritis. Clin Exp Rheumatol 2013; (in press).
. The when and how of biologics withdrawal in rheumatoid arthritis—learning from large randomized controlled trials. Clin Exp Rheumatol 2013;(in press).
. Discontinuation of infliximab after attaining low disease activity in patients with rheumatoid arthritis: RRR (remission induction by Remicade in RA) study. Ann Rheum Dis 2010;69:1286–91.
. A Multicenter, Randomized, Controlled, Open-Label Pilot Study of the Feasibility of Discontinuation of Adalimumab in Rheumatoid Arthritis Patients in Stable Clinical Remission. Arthritis Rheum 2012;64(Suppl):S336.
. Maintenance, reduction, or withdrawal of etanercept after treatment with etanercept and methotrexate in patients with moderate rheumatoid arthritis (PRESERVE): a randomised controlled trial. Lancet 2013;381:918–29.
. Discontinuing treatment in patients with rheumatoid arthritis in sustained clinical remission: exploratory analyses from the BeSt study. Ann Rheum Dis 2011;70:315–9.
. Adjustment of therapy in rheumatoid arthritis on the basis of achievement of stable low disease activity with adalimumab plus methotrexate or methotreate alone: the randomised controlled OPTIMA trial. Lancet 2013; (in press).
. Targeting the lowest efficacious dose for rheumatoid arthritis patients in remission: clinical and structural impact of a stepdown strategy trial based on progressive spacing of TNF-blocker injections (STRASS trial). Ann Rheum Dis 2013;72(Suppl 3):72.
. Abatacept biologic-free remission study in established rheumatoid arthritis—ORION study. Ann Rheum Dis 2013;72 (Supple 3):613.
. Discontinuation of tocilizumab after attaining remission in patients with rheumatoid arthritis. Ann Rheum Dis 2013;72(Suppl 3):877.
. Dose reduction in patients with rheumatoid arthritis responding to the standard rituximab regimen. Ann Rheum Dis 2013;72(Suppl):877.
. Effect of discontinuing TNFalpha antagonist therapy in patients with remission of rheumatoid arthritis. Joint Bone Spine 2009;76:350–5.
. Randomised placebo-controlled study of stopping second-line drugs in rheumatoid arthritis. Lancet 1996; 347:347–52.
. Withdrawal of DMARDs in patients with Rheumatoid Arthritis: a systematic review and meta-analysis. Ann Rheum Dis 2010;69:1823–6.
. Sustained drug-free remission in rheumatoid arthritis after DAS-driven or non-DAS-driven therapy: a comparison of two cohort studies. Rheumatology (Oxford) 2012;51:1120–8.
. Do cardiovascular risk factors confer the same risk for cardiovascular outcomes in rheumatoid arthritis patients as in non-rheumatoid arthritis patients? Ann Rheum Dis 2008;67:64–9.
. Association of chronic inflammation, not its treatment, with increased lymphoma risk in rheumatoid arthritis. Arthritis Rheum 2006;54:692–701.
. Methotrexate and mortality in patients with rheumatoid arthritis: a prospective study. Lancet 2002; 359:1173–7.
. The effect of methotrexate on cardiovascular disease in patients with rheumatoid arthritis: a systematic literature review. Rheumatology (Oxford) 2010;49:295–307.
. Tumour necrosis factor antagonists and the risk of cardiovascular disease in patients with rheumatoid arthritis: a systematic literature review. Rheumatology (Oxford) 2011;50:518–31.
. Rheumatoid arthritis joint progression in sustained remission is determined by disease activity levels preceding the period of radiographic assessment. Arthritis Rheum 2009;60:1242–9.
. Etanercept compared to intraarticular corticosteroid injection in rheumatoid arthritis: double-blind, randomized pilot study. J Rheumatol 2011;38:1009–11.
. Use of glucocorticoids in rheumatoid arthritis—pratical modalities of glucocorticoid therapy: recommendations for clinical practice based on data from the literature and expert opinion. Joint Bone Spine 2010;77:451–7.
. Comparison of long-term clinical outcome with etanercept treatment and adalimumab treatment of rheumatoid arthritis with respect to immunogenicity. Arthritis Rheum 2012;64:3850–5.
. 2012 update of the 2008 American College of Rheumatology recommendations for the use of disease-modifying antirheumatic drugs and biologic agents in the treatment of rheumatoid arthritis. Arthritis Care Res (Hoboken) 2012;64:625–39.
. EULAR standardised operating procedures for the elaboration, evaluation, dissemination, and implementation of recommendations endorsed by the EULAR standing committees. Ann Rheum Dis 2004;63:1172–6.
. Follow-up standards and treatment targets in rheumatoid arthritis: results of a questionnaire at the EULAR 2008. Ann Rheum Dis 2010;69:575–8. Contributors JSS and RL wrote the first draft with help from DvdH. SR, JN and CGV performed the literature review. All authors participated in the activities of the Task Force and have provided important contributions to the manuscript. Funding European League Against Rheumatism. Competing interests All the participants in this initiative have disclosed any conflicts of interest. After review by the EULAR Steering Committee, these potential conflicts have been considered as either absent or acceptable with this initiative. The individual declarations of conflicts are available on demand at the EULAR secretariat and are summarised below as remuneration for consultation and/or speaking engagements (‘R’), research funding (‘F’) or ‘none’. JSS—R: Abbott/Abbvie, Amgen, Astra-Zeneca, BMS, Celgene, Glaxo, Infinity, Janssen, Lilly, Medimmune, MSD, Novo-Nordisk, Pfizer, Roche, Samsung, Sandoz, Sanofi, UCB, Vertex; F: Abbott, BMS, MSD, Pfizer, Roche, UCB. RL—R: Abbott/AbbVie, Ablynx, Amgen, Astra-Zeneca, Bristol Myers Squibb, Centocor, Glaxo-Smith-Kline, Novartis, Merck, Pfizer, Roche, Schering-Plough, UCB, Wyeth; F: Abbott, Amgen, Centocor, Novartis, Pfizer, Rhoche, Schering-Plough, UCB, Wyeth. FCB—R: Abbvie, Merck. MB—R: Abbott, Bristol Myers-Squibb, Chugai, Pfizer, Roche; F: Pfizer. GB—Abbott/Abbvie, BMS, MSD, Pfizer, Roche, UCB; F: Abbott, BMS, Pfizer, Roche, UCB. MD—R: Abbott/Abbvie, Pfizer, Roche, UCB, BMS, Hospira, Lilly, Novartis, Sanofi; F: Abbott, Roche. PE—R: MSD, Pfizer, Abbott, Novartis, UCB, Roche, BMS, Lilly, Takeda, Janssen; F: MSD, Roche. CGV—R: Abbvie, BMS, MSD, Pfizer, Roche-Chugai, UCB; F: Expanscience, Nordic Pharma, Pfizer. LG—R: Abbott, BMS, Chugai, Pfizer, Roche, UCB. JN—R: UCB. SR—R: Fundação para a Ciência e Tecnologia. KW—R: Pfizer, Genentech, UCB, Abbott. MdW—R: Abbvie. DA—R: Pfizer, Abbott, MSD, Janssen, Grünenthal, Medac; F: MSD. NB—R: Pfizer, BMS, Roche. JWJB—R: Abbott, BMS, MSD, Mundipharma, Novartis, Pfizer, Roche, UCB; F: Abbott, BMS, MSD, Novartis, Pfizer, Roche, UCB. MB—R: Novartis, Celgene, BMS, UCB, AstraZeneca, Roche, Mundipharma. FB—R: Abbott, Amgen, Horizon, Medac, Mundipharma, Pfizer, Roche, Servier, UCB, Zalicos; F: Horizon, Medac, Pfizer. BC—BMS, Celgene, Lilly, MERCK, Novartis, Pfizer, Roche-Chugai, UCB; F: Pfizer. MC—R: Abbott, Pfizer, Sanofi Aventis, Theva, Celgene, Mundipharm, BMS, Actelion; F: BMS, Actelion. ND—R: Pfizer, MSD, Abbott, Roche. JMWH—none. MK—none. TKK—R: Abbott, Astra-Zeneca, BMS, MSD, Pfizer, Roche, UCB; F: BMS, MSD, Pfizer, Roche, UCB. XM—BMS, GSK, Neovacs, Pfizer, Roche, UCB. KP—R: AbbVie, Gedeon Richter, Roche, Pfizer, MSD, Amgen, Servier, BMS. PLCMvR—R: Abbvie, BMS, Roche, Pfizer, UCB, MSD; F: Abbvie, BMS, Roche, Pfizer, UCB. ARR—R: Abbott, BMS, UCB, MSD, Roche, Chugai, Pfizer. MSV—none. DLS—R: MSD, UCB, BMS; F: Pfizer. TSI—R: Abbott, Medac, Pfizer, UCB, BMS, GSK, MSD; F: Abbott, Pfizer. JBW—None. DvdH—R: Abbott, Amgen, AstraZeneca, BMS, Centocor, Daiichi, Eli-Lilly, GSK, Janssen Biologics, Merck, Novartis, Novo-Nordisk, Otsuka, Pfizer, Roche, Sanofi-Aventis, UCB; Director of Imaging Rheumatology bv; F: UCB, Pfizer.